Sony got a lot of praise for their Xperia Z smartphone at CES, with many voting it the best phone at the event. Now Sony have added another device to their line, the Xperia Tablet Z. The tablet has a lot of the same features the smartphone has to offer. 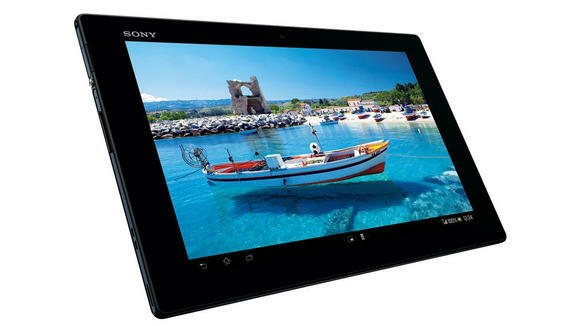 Unlike the previous Sony tablet, which you may remember had the curved edge that allowed users to easily hold the device, the Xperia Tablet Z is a thin, light design, much like all the other Android tablets available right now. The tablet has an impressive 10.1-inch 1,920 x 1,200 full HD display. We are surprised that Sony is continuing to place faith in the ten inch model, when the seven-inch models are much more popular on Android. Other specs for the Xperia Tablet Z include a 1.5GHz quad-core processor, 2GB of RAM and 32GB of internal storage. If you are looking for a powerhouse, there are plenty to choose from at the moment. With new processors released at CES, we may see much more powerful tablets in the coming months. The Xperia Tablet Z is, like its smartphone brother, waterproof and dustproof, it also comes with a 8.1MP rear camera, but no front camera. Sony has added NFC, LTE and a microSD slot for every type of user. Android Jelly Bean powers the phone, underneath the Bravia skin Sony apply. The Mobile Bravia Engine isn’t as bad as some skins we have used on Android, and in some ways it enhances Android. The product seems to be only for the Japanese market, for now. We suspect with the poor sales most Android tablets have suffered in Europe and US, some manufacturers want to test their versions on home ground before sharing it with the world. We have no details on pricing, but our gut instinct tells us high-end is Sony’s plan.